The Iraq War was a military conflict that lasted seven years, from 2003 to 2011, and cost $1.06 trillion. President George W. Bush launched it to eliminate the threat from Iraq's Sunni leader, Saddam Hussein. He announced Hussein was developing weapons of mass destruction. The Iraq War was part of the ​War on Terror. That was the U.S. response to the 9/11 terrorist attacks by al-Qaida. The war added more than $1 trillion to the U.S. debt. That includes increases to the Department of Defense and the Veterans Administration base budgets. The DoD base budget grew by $193 billion during the Iraq War. The VA budget expanded by $47.7 billion. Some of those increases are attributable to the War in Afghanistan. It also includes the $819.7 billion in Overseas Contingency Operations funds specifically dedicated to the Iraq War. That's more than the $738 billion in inflation-adjusted dollars spent on the Vietnam War. It's second only to the $4.1 trillion in inflation-adjusted dollars spent during World War II. The U.S. military budget includes both the base budget, subject to sequestration, and extra funds appropriated to overseas wars. FY 2003 - $90.3 billion: On March 19, the United States invaded Iraq with "Shock and Awe." Massive bombing and a ground invasion toppled the Hussein regime the next month. FY 2004 - $90.9 billion: In April, the United States laid siege to the Sunni-held city of Falluja. That same month, photos of torture at the almost Abu Ghraib prison further incited insurgents. In June, the U.S. appointed Shiite leader Iyad Allawi as Prime Minister. Despite this, Shia radicals turned on the United States in Najaf two months later. In November, the U.S. military launched a major offensive against Sunni insurgents in Falluja. This Sunni-Shia split is the underlying cause for tensions in the Middle East. FY 2005 - $105.8 billion: In April, Iraq named Kurdish leader Jalal Talabani as president, and Shiite Ibrahim Jaafari as Prime Minister. In May, Sunni insurgents killed 672 people in car bombings, double the 364 killed in April. In October, voters approved a new constitution. It aimed to create an Islamic federal democracy. In December, they elected a new parliament. FY 2006 - $108.3 billion: The United States responded to escalating violence between Shiites, Sunnis, and Kurds that killed more than 34,000 civilians. In February, Sunnis bombed an important Shia shrine in Samarra. In April, newly re-elected President Talabani asked Shia candidate Nouri al-Maliki to form a new government. An al-Qaida leader, Abu Musab al-Zarqawi, was killed in Iraq. In November, Iraq and Syria restored diplomatic relations after almost 25 years. In the Shia area of Sadr City in Baghdad, more than 200 died in car bombings. In December, Saddam Hussein was quietly executed. FY 2007 - $155.9 billion: Bush announced a surge of 20,000 additional U.S. troops to help transition power to Iraq leaders. In February, more than 130 troops were killed by bombs in Baghdad's Sadriya market. In March, hundreds more were killed when Sunnis exploded three trucks filled with toxic chlorine gas in Falluja and Ramadi. In April, 200 people died from bombs in Baghdad. In August, 250 people were killed by truck and car bombs in two Kurdish villages. Shia and Kurdish leaders formed an alliance to support Prime Minister Maliki. U.S.-contracted Blackwater security guards killed 17 civilians in Baghdad. By December, Britain handed over the security of the Basra province to Iraqi forces. FY 2008 - $196.8 billion: In January, the Iraqi Parliament allowed former officials from Saddam Hussein's Baath party to return to public life. In March, Iranian President Mahmoud Ahmadinejad visited. Hundreds were killed when Prime Minister Maliki cracked down on Moqtada Sadr's Mehdi Army in Basra. In September, the United States handed over the Sunni province of Anbar to the Shia-led government. Bush signed the Status of Force agreement which promised to remove all U.S. troops from Iraq by 2011. FY 2009 - $132.9 billion: In January, Iraq took control of security in Baghdad's Green Zone. In June, U.S. troops withdrew from all towns and cities, handing over security duties to Iraq. In July, Masoud Barzani of the KDP was re-elected as president. In December, the Islamic State group claimed responsibility for suicide bombings in Baghdad that killed at least 367 people that year. Tension flared with Iran when its troops briefly occupied an oilfield in Iraqi territory. In November, President Obama agreed to pull out troops by 2011. FY 2010 - $83.4 billion: Troops withdrew, leaving 50,000 to advise Iraqi forces and protect U.S. interests until 2011. FY 2011 - $50.9 billion: All U.S. troops left Iraq by end of December. The Shia government suppressed the Sunni minority. The Iraqi military became weak. Both fueled the rise of the Islamic State group. 2012-2014 - $7.8 billion: The United States supported contractors who stayed in Iraq to protect U.S. interests. 2015–2016 - $38.7 billion: Troops returned to Iraq to train local soldiers to defeat the Islamic State group. $36.7 $51.0 $2.6 $90.3 123,700 Shock and Awe. $11.6 $76.7 $2.6 $90.9 142,600 Drawdown. $10.5 $96.0 $1.8 $108.3 133,718 Troop surge. $20.9 $130.8 $4.2 $155.9 161,783 Surge peaks. $47.5 $143.9 $5.4 $196.8 148,500 Surge ends. $34.2 $93.1 $5.6 $132.9 114,300 Troops leave cities. $14.7 $64.8 $3.9 $83.4 47,305 Drawdown. $0.3 $46.5 $3.3 $50.9 11,455 Troops out. Contractors remain to maintain U.S. interests. * Boots on Ground is the number of troops in Iraq. From 2003 to 2013, it's as of December of that year. Source: "The Cost of Iraq, Afghanistan, and Other Global War on Terror Operations Since 9/11," Table A-1, Amy Belasco, Congressional Research Service, December 8, 2014. 2014 - 2016 are closest quarter available. Source: "Department of Defense Contractor and Troop Levels in Iraq and Afghanistan: 2007-2017," Table 3, Heidi M. Peters, Congressional Research Service, April 28, 2017. OMB, Historical Tables. The real cost of the Iraq War is more than the $1.06 trillion added to the debt. First, and most important, is the cost borne by the 4,488 U.S. troops who died, the 32,226 who suffered injuries, and their families. More than 90 percent of soldiers wounded in Iraq survived thanks to improvements in battlefield medicine. That's up from the 86.5 percent injured who survived the Vietnam War. The higher survival rate also means many now must live with complex and grave damage. Twenty percent are being treated for Traumatic Brain Injury. Another 20 percent have either Post Traumatic Stress Disorder or depression. In addition, 796 suffered major limb amputation, while 235 died from self-inflicted wounds while serving in Iraq. On average, 20 veterans commit suicide each day according to a 2016 VA study. The Iraq and Afghanistan Veterans of America found that 47 percent of its members knew of someone who had attempted suicide after returning from active duty. The group considers veteran suicide to be its number one issue. The cost of veterans’ medical and disability payments over the next 40 years is more than $1 trillion. That's according to Linda Bilmes, a senior lecturer in public finance at Harvard’s Kennedy School of Government. “The cost of caring for war veterans typically peaks 30 to 40 years or more after a conflict,” Bilmes said. Most American families did not feel the cost of the Iraq War at the time. First, there was no draft as there was in the Vietnam War or World War II. Second, there was no additional tax. As a result, those who served and their families bore the brunt. They will pay at least $300 billion over the next several decades to pay for their injured family members. That doesn't include lost income from jobs they quit to care for their relative. Future generations will also pay for the addition to the debt. 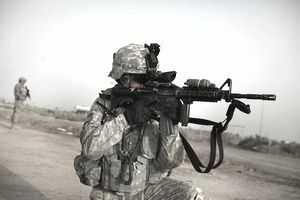 Researcher Ryan Edwards estimated that the United States incurred an extra $453 billion in interest on the debt to pay for the wars in the Middle East. Over the next 40 years, these costs will add $7.9 trillion to the debt. Companies, particularly small businesses, were disrupted by National Guard and Reserve call-ups. The economy has also been deprived of the productive contribution of the service members killed, wounded, or psychologically traumatized. There's also the opportunity cost in terms of job creation. Every $1 billion spent on defense creates 8,555 jobs and adds $565 million to the economy. That same $1 billion in tax cuts stimulate enough demand to create 10,779 jobs. That puts $505 million into the economy as retail sales. The same $1 billion spent on education adds $1.3 billion to the economy and creates 17,687 jobs. The Bush administration wanted to eliminate the terrorist threat of Iraq's leader, Saddam Hussein. He was not affiliated with al-Qaida. But he was a Sunni Muslim who used violence to expand his power. Saddam Hussein was Iraq's Sunni leader from 1979 until the U.S. invasion in 2003. The United States installed a leader from the Shiite majority. The Sunnis believe that Shiites, the majority in Iran, want to revive Persian rule over the Middle East. Sunni Saudi Arabia and Shiite Iran battle to control the Straits of Hormuz through which 20 percent of the world's oil passes. The United States wanted to install a pro-U.S. government to stabilize the region. It thought that would defuse the unease between Iranian Shiites and Saudi Arabian Sunnis. It would also put pressure on Middle East kingdoms to allow more democracy. Then they would stop shielding al-Qaida and other anti-U.S. terrorist groups. The Administration thought Hussein was a bigger threat than North Korea's dictator, Kim Jong-il. He could finance his terrorism with oil revenue. Troops never did find proof of chemical, nuclear, or biological weapons of mass destruction. But there was grave concern that Hussein was building that capacity. He had used chemical weapons on Kurds in Iraq. Both parties in Congress and 70 percent of the American people supported the war. Many thought we should have eliminated Hussein in the first Gulf War after he invaded Kuwait. This concern escalated after 9/11. In addition, the War in Afghanistan overthrew the Taliban quickly. Supporters thought the Iraq War would be easily won. The Iraq war is not over even though U.S. troops are out. Fighting between the country's Shiite majority and Sunni minority continues. Sunnis are ostracized by the Shiite-led government. These frustrations drive the conflicts in Syria and Lebanon as well. In fact, 2013 was the deadliest since 2008, the height of the war. The war had weakened al-Qaida in Iraq, Afghanistan, and Pakistan. But frustrations created a new terrorist threat. The Islamic State group promised a new homeland for Sunnis in the region. The cost to fight the Islamic State group in Iraq has spread to Syria, Jordan, and Lebanon. The Islamic State group also took its war to Brussels, Paris, California, Berlin, and many other spots throughout the world. How Would the Economy Be Different If Hillary Had Won?